Mattracks rubber track conversion systems are featured in the film Taxi 3, released in France on January 29th, 2003. The film is now showing throughout Europe and was recently released in Japan. Daniel, a taxi driver and one of the central characters in the movie, comes to the aid of the police in his heavily modified Peugeot 406 taxi. During snow action scenes set in the French Alps, the Mattracks equipped Peugeot taxi travels over the snow with ease. The Mattracks equipped specialty vehicle was assembled for the film by Equip’ Raid, a French company that builds and prepares off-road racing and specialty vehicles. 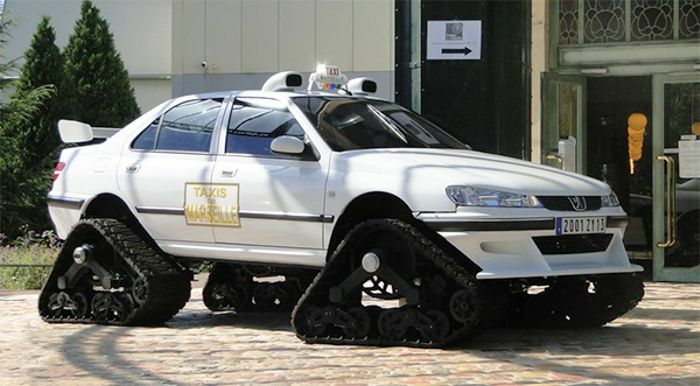 Equip’ Raid transformed a Peugeot 406 into a 4-wheel-drive vehicle making it a fully functional, Mattracks equipped, off-road vehicle for use in the snow scenes.